Wow ... has there ever been an explosive moment like it? 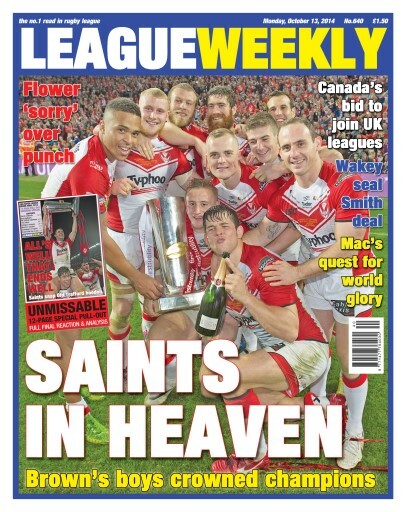 "Roses are red – and Flower sees red too, Saints are the champs, and Wigan feel blue!" We have an 8 page Grand Final special, plus news and reaction to THAT punch by Ben FLower that shook the world of sport. PLUS ... A CANADIAN team looks set to enter the Championships in 2016. A Toronto consortium have WOWED club chairmen with their audacious plans. Read all about it ONLY in League Weekly on Monday. There's everything else too in the world of Rugby League ahead of England setting out for an explosive Four Nations tournament in Australia. League Weekly ... there can be only one!